This meal was so damn good lol. If you like crab, this is the spot! Located on Wilshire Blvd in Koreatown, the Boiling Crab is always packed and you will most likely experience long wait times, but it was definitely worth it! Menu is simple- basic seafood (crab, shrimp, clams, oysters, etc.) with delicious sides and your choice of sauces and marinades. It gets messy so don’t dress up! Take a look at the mess I made LOL…. Loved these fries! These are my favorite type of fries. We got sides of ranch and it was heaven for me. Perfectly spiced. Destroyed this basket in 2 minutes tops! 1 POUND SHRIMP W/ “THE WHOLE SHA BANG”! It was a sight to see me crack these things with sauce everywhere lol. I don’t have patience for the amount of work it takes to crack crab legs when you’re hungry, but when I did and the meat came out it felt very rewarding lol. Again, the sauce was absolutely amazing…so much flavor. Anything spicy with garlic I love! One of the best crab I’ve ever had. JUST DIRTY. HOW I ROLL…LOL. I NEEDED A SHOWER AFTER THIS MEAL! 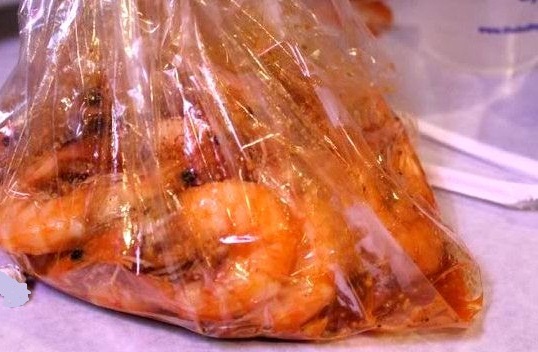 You won’t be disappointed at The Boiling Crab. It’s an experience-messy, fun and delicious. It’s quite the hot spot though so make sure you are OK with waiting for a table! A tip is to call in advance to see how long the wait is to be prepared. The Boiling Crab is definitely an amazing seafood spot in LA. I will be back soon. Enjoy and don’t be afraid to get messy! My name is Jenny and I work with Boiling Crab’s marketing team. I just wanted to say thanks for your visit and post! Keep up the great blogging and foodie adventures. I would love to keep in touch if you can shoot me an e-mail. Cheers!